Through simple frameworks brought to life with stories from the trenches, leaders will be able to see their own teams--and themselves--from a new perspective. Paradoxically these methods will enable leaders to improve their team's performance exponentially while expending half the effort. As the Chief Operating Officer (COO) of the Consumer Financial Protection Bureau (CFPB), Victor Prince helped build a new Federal agency and led a division of hundreds of people. As a consultant with Bain &amp; Company, he helped clients across the United States and Europe develop successful business strategies. Today, Victor is a consultant and speaker who teaches strategy and leadership skills to clients around the world. Mike Figliuolo is the founder and managing director of thoughtLEADERS, LLC, a professional services firm specializing in leadership development. He is the author of One Piece of Paper: The Simple Approach to Powerful, Personal Leadership and is a nationally recognized speaker and blogger. Before founding his own company, he was a consultant at McKinsey &amp; Co., and an executive at Capital One and Scotts Miracle-Gro. "I strongly recommend Lead Inside the Box for leaders at all levels. It provides practical and simple guidance for how to better spend your time and energy to get better results from your team while improving your relationship with them at the same time." "WOW! Mike Figliuolo does it again. 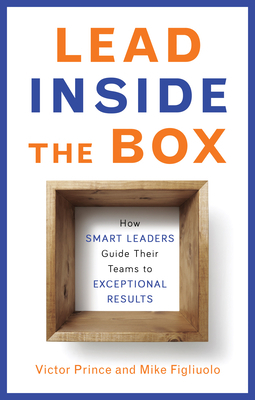 Lead Inside the Box takes a complex topic--prioritizing leadership effort to maximize productivity--and makes it both approachable and manageable. This book provides a strategic matrix and immediate tools to use your 'leadership capital' for maximum team success. What are you waiting for? Buy this book, apply the concepts, and lead smarter." "Refreshingly pragmatic, authors Victor Prince and Mike Figliuolo offer a simple yet powerful everyday framework for more effectively leading people and getting better results." --David K. Lenhardt, former president and CEO of PetSmart, Inc.